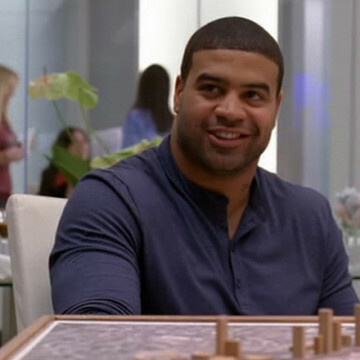 Shawne Merriman offers an Entourage cameo in season seven’s fourth episode, titled Tequila Sunrise. He sits in on a meeting at TMA as Ari pitches a bunch of Hollywood executives his ideas for bringing an NFL team to Los Angeles. Linebacker Shawne Merriman was drafted to the Chargers in 2005, was acquired by the Buffalo Bills in 2010, and officially retired from the league in 2013. He led the NFL in sacks in 2006.